Own More, Be More – Become A Battlefield 4 Premium Member Get early access to themed digital expansion packs, new weekly content and exclusive personalization options at a great value. Battlefield 4 Premium membership includes: Five digital expansion packs featuring new multiplayer maps and in-game content Two-weeks early access to all expansion packs for that competitive edge Exclusive personalization options including camos, paints, emblems, dogtags and more Priority position in server queues New weekly content and challenges: 12 Battlepacks – one per month for 12 months Requires the base game Battlefield 4 to activate…..
Get everything and dominate the Battlefield. 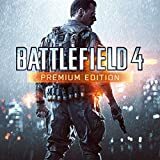 You’re finally ready to join the fight, and Battlefield 4 Premium Edition is the best way to do it. The Premium Edition ensures that you’ll have everything you need to join your friends and jump into 64-player first-person battles. Snipe the enemy from the back of a hovercraft. Strategize your assault from a more tactical overhead view. Change the complexion of the fight by annihilating large-scale structures. Battlefield 4 gives you the freedom to wage war your way, with multiple soldier classes, modifiable weapons and unique vehicles you won’t find in other military…. Battlefield 4 is the genre-defining action blockbuster made from moments that blur the line between game and glory. Fueled by the next-generation power and fidelity of Frostbite 3, Battlefield 4 provides a visceral, dramatic experience unlike any other. Only in Battlefield can you demolish the buildings shielding your enemy. Only in Battlefield will you lead an assault from the back of a gun boat. Battlefield grants you the freedom to do more and be more while playing to your strengths and carving your own path to victory. In addition to its hallmark multiplayer, Battlefield 4 features an intense, dramatic character-driven….